I was in a local bookstore this week and came across this adorable picture book, Goodnight, Me. It is such a charming story and so beautifully illustrated – I bought it for my grandson. In case it had not come to your attention yet, I decided to review it. One reviewer called the character in it a monkey, but take a good look at the image I posted above .. wouldn’t you say that is a baby orangutan? And what an adorable baby it is. This story is focused around the point-of-view of the main character. The little one is convincing his body to calm down for sleep. He names body parts and, mentioning some of what they do in his busy day, he tells them to settle down for the night. Feet, knees, legs, tummy, bottom (“Enough wriggling, bottom. It’s time to be still.”), chest, hands, arms, neck, head, mouth, eyes (“Can you see any dreams yet?”). As his mother tucks him in and kisses him goodnight, he is drifting off to sleep. It is the cutest story. This first picture book by Andrew Daddo is a wonderful bedtime book to help a child relax and settle down for sleep, and also would be fun for a child who is learning to read. The illustrations by Emma Quay are delightful – soft and realistic-looking of the little orangutan. This is a book to treasure. You can find Goodnight, Me listed on my BUY THE BOOK! page. 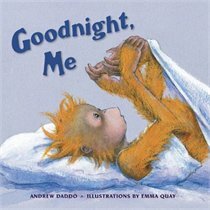 This entry was posted in Mostly About Reading, Reviews & Interviews and tagged anatomy, Andrew Daddo, babies, bedtime story, Emma Quay, Goodnight Me, illustration, orangutan, Picture book, sleepy. Bookmark the permalink. This sounds like a cute book! I think it is a baby orangutan too (Orangutans can get pretty big. A full-grown male can get to about the size of a gorilla.). I like the idea! Thanks for the info, Erik. 🙂 This is a very cute book. I know a couple of older folks who tend to roam the house at 3 a.m. Maybe they could use the book, too! It’s not my problem, thank goodness, but the person who comes up with a sleep-inducing book for big people could make a bundle! Oh, I do agree! What a great thing that would be.